Triple R’s vision is to provide current and future customers Oil Management Solutions in a wide area of applications that will help them realize Savings and reach Sustainability targets. A unique filter concept with an unmatched efficiency! “OIL PURIFICATION” instead of Oil filtration. Wide product range to cover all applications and solve every oil related problem. Hydraulic, Diesel, Engines, Lube systems & Water Glycol. Bypass, Off-line & Mobile oil filtration systems. For Oil systems from 10 lit up to 100.000 lit. High dirt load removal systems. Water removal: water separators and vacuum dehydrators. 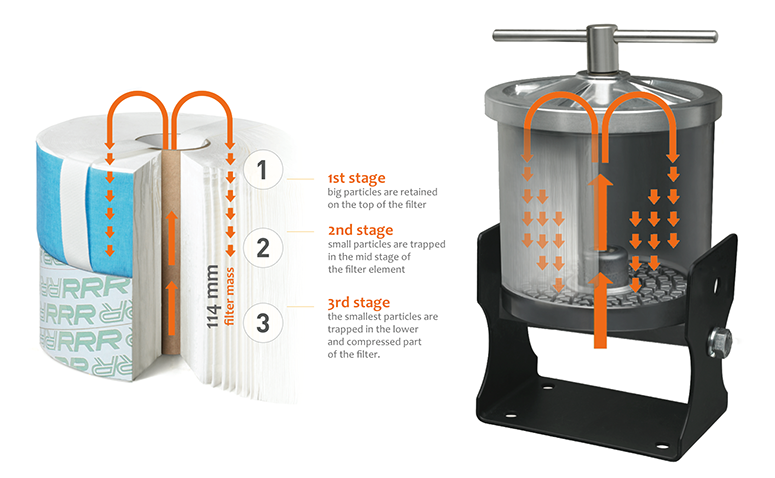 Air separation with the vacuum dehydrator or the Quicktoron series. Specific elements for every application for optimal efficiencies. All elements are officially Multipass Absolute tested. Our β–ratio’s and µ-ratings are 100% certified!